clerking), any advice on going solo out of law school? For starters (and even though my reader didn’t ask this question), I harbor mixed feelings about attorneys going solo immediately after law school. On the one hand, I absolutely believe that with enough determination and desire, going solo after law school can be done successfully (and when my archives return, I’ll post to links to stories about where that has happened). Moreover, for new graduates who’ve had careers prior ot law school and potential contacts through that experience, going solo right after law school may be the best way to capitalize on prior work experience. At the same time, however, I don’t think going solo is an optimal situation for new graduates. It’s not so much because new grads lack legal experience but rather, they haven’t yet developed contacts in the legal and business community. Going solo is exhilerating, yes, but it can also be demanding and nervewracking. It’s tough enough to try to master new skills and run a business and market while at the same time havingthe added burden of introducing yourself to other lawyers in the community and establishing some credibility with them. A post-law school job – even one that only lasts a year or two – can help a new grad establish presence and credibility and get paid for doing it. For example, if you work for a judge after law school, you have an opportunity to meet the dozens of lawyers who appear before the court. You also have a chance to join the local bar and perhaps organize CLEs or other events which is a great way to get to know colleagues. All while you’re collecting a paycheck. Same is true for a post law school job at any firm big or small. The second advantage of working for a spell before starting a firm is that your former employers can serve as references for the quality of your work if someone is thinking abour referring a matter. Having said that – and getting to the point of the question – there’s much that new graduates with no interest in litigation can do to get a practice off the ground. For starters, they can seek out contract work – either a large document review project or work for other attorneys. If they’re interested in probate matters, they might want to try to set up a relationship with a PI or immigration attorney and see if those attorneys will refer their clients for wills and estate matters. New grads can also give talks on business start ups or T&E matters to community groups as a way to drum up business. And to gain skills, many jurisdictions offer inexpensive or free pro bono training on a variety of areas, including bankruptcy, wills and guardianships which teach the basics. Usually, the only cost is a commitment to take on a case or two pro bono. This is just a quick answer – and not entirely comprehensive due to time constraints. Therefore, I’d like some feedback from readers on tips you have on getting started after law school – and of course, any success stories you might be willing to share. 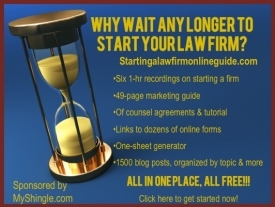 And of course, keep reading MyShingle.com (and our online guide) for new tips on starting a firm, as they emerge.